Impact factor is a metric used to evaluate the importance of a journal to its discipline or field. It measures how often scholars and researchers have cited articles in a particular journal in the most recent two years and is calculated by dividing the number times articles were cited by the total number of articles published in that same journal for the time period. Journal impact factor only applies to a journal or groups of journals and cannot be used to measure the impact of individual articles or researchers and should only be used to compare journals in the same subject area. Description: General data collection from Thomson Reuters. Allows for the evaluation and comparison of scholarly and technical journals using citation data to determine the most frequently cited, highest impact, and largest journals in a field. Search results that have been cited by others will have a link that says "Cited by [number]." Click that link to go to the citing authors. Usage: How many times was your work downloaded, viewed or clicked on? Captures: How many times has your work been bookmarked or favorited? Mentions: How many times was your work mentioned on blogs, Wikipedia, or news sites? Social Media: How many times was your work shared on social media sites like Facebook and Twitter? Provide a way to assess the immediate impact of your research. Help create a broader picture of the impact of your research from a variety of sources. Can measure the impact of other types of scholarship besides articles and books. Can offer contextual information about who is engaging with your research. They measure the attention that research is receiving (popularity), but they don't necessarily measure quality. Altmetrics are still a relatively new trend in measuring impact, and as such, there are a variety of different tools, none of which comprehensively choose and gather from the same sources of data. ORCID provides a persistent unique digital identifier for authors. ImpactStory is an altmetric aggregator that collects data from a variety of research products. It costs $60/year but you can try it for free for 30 days. 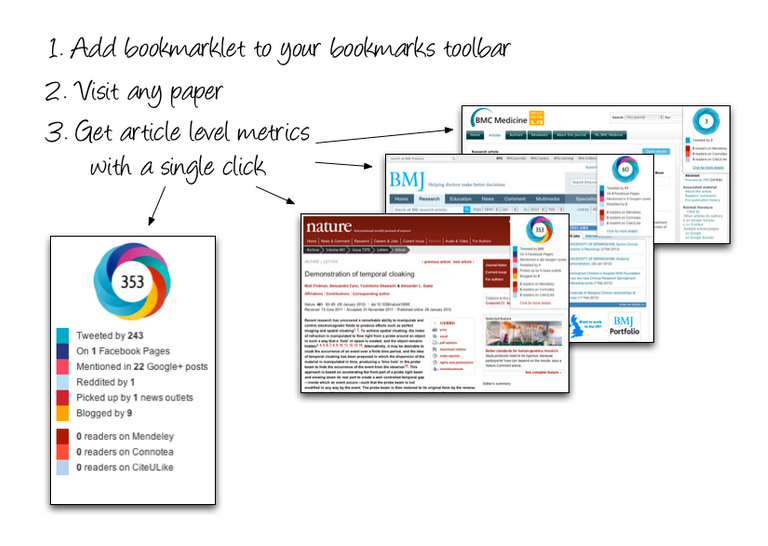 Altmetric.com is an institutional subscription-based service, but they offer a free bookmarklet that allows you to find out an article's altmetric details. Works in Chrome, Firefox, and Safari browsers. A list of altmetrics apps, including impact data from alternative sources such as citation management systems (Mendeley), Twitter, Researcher ID's, etc.